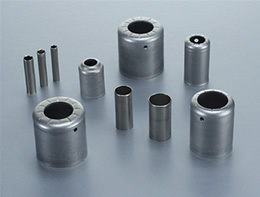 Winzeler Stamping Company has a long and rich history in the metal stamping business. Since our beginning in 1919, we have built upon our expertise as an eyelet manufacturer and have developed a proven track record for producing high-volume, defect-free die stampings. With more than 30 transfer presses ranging from 15 to 70 tons, we have equipment that is capable of producing over 500 million pieces a year. We have enhanced our decades of successful transfer press ability by focusing on the integration of current engineering analyses into our processes. Transfer press stamping is an excellent option for the production of smaller, lighter-weight parts and often offers the benefit of a low initial tooling cost. A transfer press tool can be a single die by itself or a number of dies arranged into sequential stations. A transfer press is used in circumstances where the part has to be free from the metal strip to allow operations to be performed in a free state. The transfer press process begins with a strip of metal fed into the first station where the blank for the component is cut from the strip. The blank is then transferred mechanically by transfer fingers that carry the part through various forming stations to completion. All parts are transferred to the next station at the same time. Transfer presses are extremely versatile and many part features such as pierced holes, chamfering, cut-outs, ribs, knurls and threading can be designed into primary press operations, eliminating the need for additional cost involved in many secondary operations. 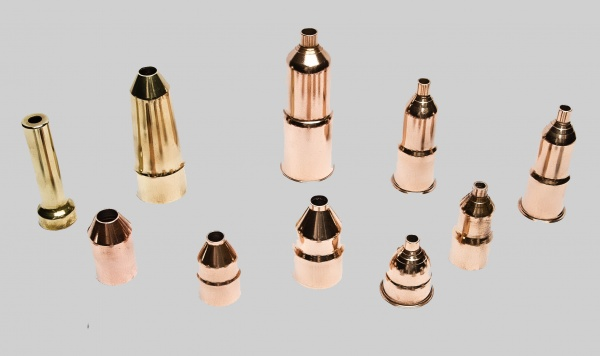 We routinely work with materials such as brass, copper, aluminum, stainless steel, carbon steel, HSLA steel, as well as polypropylene and nylon that is used in our injection molding process. 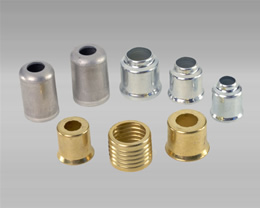 Winzeler Stamping Company can also help you make conversions to more economical parts from other production methods such as screw machining . In certain instances, multiple piece assemblies can be made into a single component produced by a transfer press, saving you money. We are experts in the utilization of deep drawn metal stamping technology, which can be performed using transfer presses or progressive presses. Our engineering team will evaluate your part or print and determine which manufacturing solution is best for your situation. Proponents of smarter and leaner manufacturing, we are always looking for ways to help you keep your costs in check. Let’s work together. 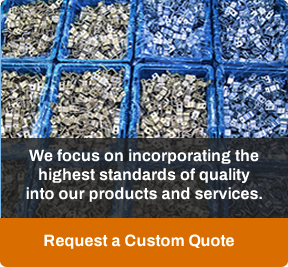 Send your electronic file and request a quote now.